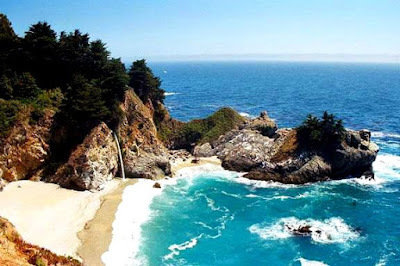 We packed our packs and took a long drive up the coast to Big Sur where we camped, hiked and communed with nature. On one of our last hikes we discovered a top secret campsite beneath a few redwoods, nestled atop a cliff that overlooks the ocean. If you glimpse the photo seen here, the campsite was hidden away in the trees on the cliff above the waterfall. It looked pretty perfect as it was complete with a glorious vista and the accompanying soundtrack of crashing waves, which we decided will either sing us to sleep or keep us awake, but either way, we plan to make a reservation in the near future for this super exclusive campsite. Want to come? This looks like a dream come true. My favorite thing about Nor Cal is the mountains being right next to the beach! The answer to your question is yes.